"This is all on me. I disappointed the market, the running community and I disappointed myself . . . To own the L.A. Marathon and screw it up is a monumental failure." Midwest Distance Gala High Schooler Robert Finnertty Runs 4:01.09 Mile Our apologies for not featuring this earlier. Wejo didn't realize in looking at the results the kid is in high school. Although a letsrun.com poster was singing Finnerty's praises 3 years ago here. NCAA Day 4: LRC Hernandez Edges Wheating, Manzano Wins, Hannah England Runs NCAA Record The Wheating, Hernandez duel more than lived up to its hype. 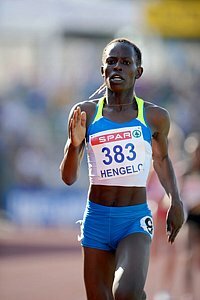 Leo Manzano went out in style, Hannah England ran very fast, but she owes a big thank you to Sally Kipyego. Not to mention, Cornell won the men's triple jump for the 2nd straight year, Walter Dix in the 200, Cory Martin won the shot and the hammer. We recap the action. *IAAF Recap of Day 2 of NCAAs Focuses on LJ's Brittany Reese seemed disappointed with her world leading win as she was hoping to go 23' feet but says injuries have hurt her. Meanwhile, FSU freshman Ngonidzashe Makusa was obviously thrilled with his 27'2.75" performance that made him the #4 guy in the world and gave him an win by almost a foot. Alan Culpepper To Skip Olympic Trials With Injury Lengthy profile on Alan and his family. *Alicia Shay Out of Olympic Trials If anyone deserved a bit of better luck with running injuries this year it was her. It's Not Too Late to Go to the Trials Mention LetsRun.com and save $100 off a Trials package. We hear its even possible to still buy meet tickets.